This is a thin plastic case intended as an ID holder but can certainly be used to store other slim items, as a wallet or as a case for a small survival or first aid kit. The case is 4.25'' wide, 3.25'' high and 0.75'' thin. It is made of crush resistant see-through clear plastic that opens with an angled latch for better access to the inside. It is closed with a small pressure clip and has a rubber seal to make it waterproof. 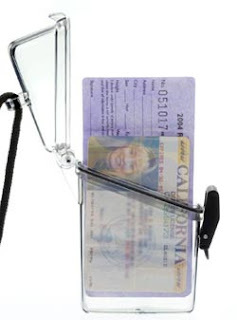 Inside you can keep your ID badge, some money, credit cards and your choice of items as long as they are thin. It is good to store alcohol pads, band aids and other very thin items for a small first aid kit or maybe an ID-badge first aid kit. It comes with a nylon lanyard featuring a breakaway clip for neck carry it can also be carried in a pocket or hanging from a backpack there is no pocket clip for pocket carry. The size is good even for large ID bags and will hold some folded bills and credit cards if needed if you have some stuff that you want to carry with your ID badge this is a nice case. If you don't carry an ID badge this case is good if you want to build a small kit as long as the items fit. The rubber seal makes the case water resistant and dunkable so it can be good to protect items that should not get wet. You can read more in the official website or order for $5 from TAD Gear.